President Muhammadu Buhari on Monday restated that his administration will continue to bring those who abuse public trust before the law. He added that proceeds recovered from embezzlers would be reinvested in the infrastructural development of the country. 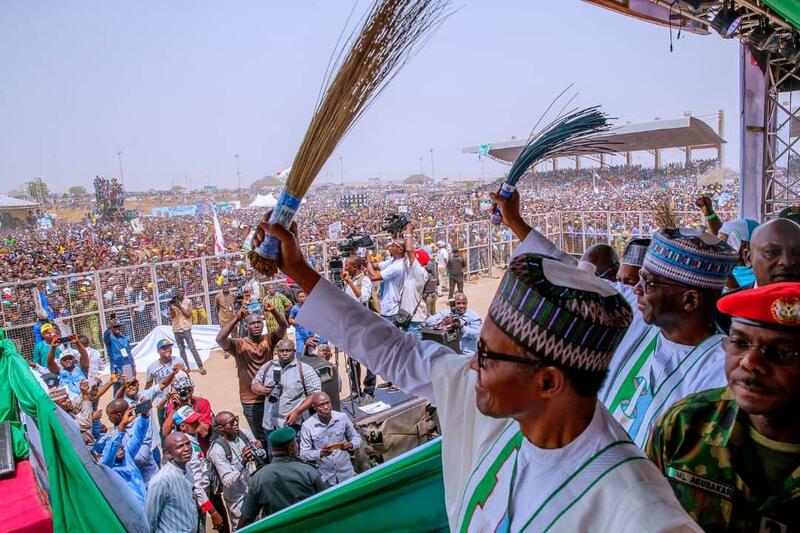 President Buhari said this at a rally in Ilorin, the Kwara State capital. “We are going to continue to take those who abuse trust before the law; collect what they have stolen and reinvest them in infrastructure,” the president stated on the campaign trail. “Wherever I go I repeat myself on these issues so as to remind you where this country was before we came in, where we are in now and what we are able to do with the resources that are at our disposal. The people of the North east as far as security is concerned, are our major witnesses of our performance. In a remark, National Leader of the APC Asiwaju Bola Ahmed Tinubu said that Kwarans have over the years been held captive by Senate President Bukola Saraki. According to him, “This is a celebration of Kwara state’s freedom. It’s been long they have been swindling your collective patrimony. And Bukola Saraki is been doing that. We are not here for conspiracy. We are not here to quarrel with the Saraki dynasty as Gbemisola Saraki is with us. National Chairman of APCnAdams Oshiohmole told the crowd of supporters that the end of Saraki dynasty had come. “The confession of Bukola Saraki after his defection from APC exposes him as a selfish politician. To him politics is about juicy jobs. That is why I am happy to be here to see the actual translation of ‘enough is enough’. Also commenting, Information and Culture Minister Lai Mohammed, said “on November 17th by-election, I said our party has broken the Berlin wall of Kwara politics. I said then that we will repeat the same thing during the 2019 elections. The minister reeled out the major infrastructural achievements of the government in the state.Chairman of APC in the state Bashir Bolarinwa said the state under the Saraki oligarchy had been underdeveloped, saying “as a first generation state, our infrastructure and institutions do not depict our status. We unfortunately are too behind other states created much later. It is a pity. We prayed, we hoped, and made a decision, that we are indeed tired of this group, of the reincarnation of the biblical Pharaoh. But Kwarans have decided that our own Pharaoh must let Kwara go. “Today’s rally is a culmination of our collective resolve to declare and let it resonate clearly that ‘enough is enough’ indeed. APC must go enough of this rubbish for one hour you can’t say what you have done or even plan to do different only to insult people and call them names what stupid politics.